Activity tracing is part of a feature that was initially introduced with WCF, named End-to-End Tracing. Its underlying implementation, however, is baked into the XmlWriterTraceListener and does not depend on WCF in any way. Currently it’s only supported in the SystemDiagnostics implementation. The activities are identified by an arbitrary guid, which is placed in the ambient singleton property Trace.CorrelationManager.ActivityId. This ID flows with threads, and in the case of WCF, you can make it flow across processes and machines. This ID must be logged somehow, however, to be picked by a tool that can correlate the traces. For that purpose, this ID is tracked viaTraceSource.Transfer, TraceEventType.Start and TraceEventType.Stop traces. 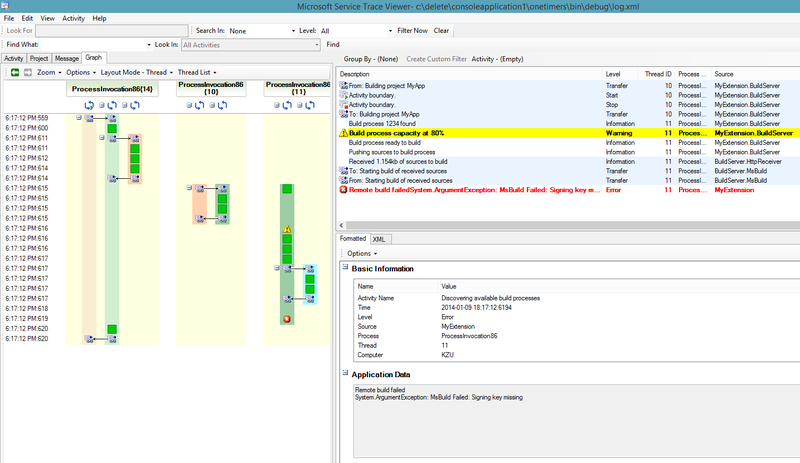 This can be achieved rather easily using the Microsoft Service Trace Viewer, since it’s able to open multiple logs simultaneously and correlate activities automatically. There’s built-in searching and filtering too, and you can also see on the right side what was the trace source for each message, as well as extended information about the computer, thread, exception or even full stack traces. The Service Trace Viewer tool is available at C:\Program Files (x86)\Microsoft SDKs\Windows\v7.0A\Bin\NETFX 4.0 Tools\SvcTraceViewer.exe(or the folder of your installed version of the Windows SDK). Note: Tracer supports Hierarchical Tracing and configuration. // start new tasks/threads, issue more traces, etc. Activities nest naturally, and the using(..) ensures that they are closed properly. Since the correlation is performed by activity identifier, it’s not necessary to wait for the related activities/tasks to complete before disposing (and therefore stopping) the parent activity. This is part of the Tracer project. This content will be updated on the Activity Tracing wiki page. Complex traces you can actually understand by leveraging Activity Tracing | Around computing January 15, 2014 at 7:27 am. Patrick December 11, 2014 at 12:44 pm. Ping times out on this IP Address. Is there any way for you to update the links to their permanent URLS instead of using a tiny URL?